Most of the discussions on improving our public education system dwell on the lack of resources to fund both the hard and soft infrastructure requirements of our public schools. While this may seem valid, I believe there is a more important and telling element that can improve academic achievement levels and participation and completion rates with the available resources that we currently have at our disposal. In one of the Synergeia consultations I attended, I recall asking a Division Superintendent whether the results of the division achievement tests form part of the basis for the promotion of principals and superintendents. The answer was qualified, with the superintendent saying that in his case, he did consider it. But as a rule, he added, this was not taken into consideration. I can only surmise that completion rates and cohort survival rates of our public schools are incidental outcomes instead of a result of a deliberate effort at the school level to make public education fully accessible to our pupils. The absence of a clear accountability system makes our public school measurement system unresponsive. While measurement is done both at the national level and the division level with the annual achievement test administered to the students, no one is made to answer for the results in a meaningful way. The achievement test conducted for a selected grade level each year provides a snapshot of how the schools, divisions and regions are faring. However, it could have better served its purpose if the performances of principals, superintendents and regional directors are tracked based on the improvements on achievement levels over time of the jurisdictions under their watch. This will compel them to localize programs that will address the inadequacies in subject areas of their respective assignments. This will compel the superintendents to make the subject area supervisors, principals and consequently the teachers to answer for the improvements in academic proficiencies of their pupils. (Let me clarify that what should be measured would be the improvement in achievement levels rather than the absolute scores.) This will refocus the resources and energies of our education officials to what it important — improving the academic proficiencies of our pupils. Our experience in Naga City demonstrates that this can be done, especially with a cooperative division superintendent. Diagnostic tests were conducted at the beginning of the year and post tests were conducted at the end of the year for all grade levels and subject areas. 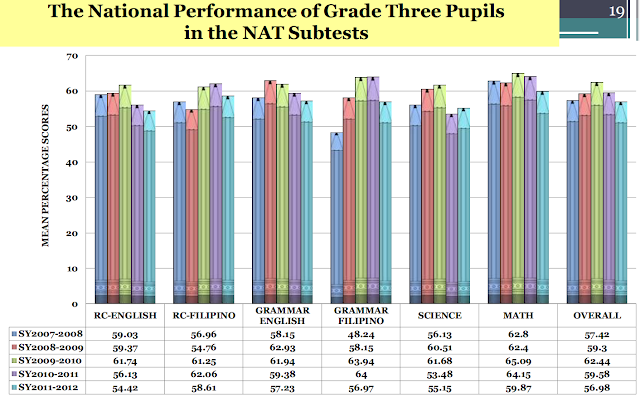 By comparing the results of the diagnostic test with that of the post test, we were not only able to assess students’ achievement levels but also the proficiencies of the teachers for the different subject areas per grade. In fact, a portion of the incentive allowance provided by the city government to the teachers was determined by the improvements in achievement levels of the school — meaning to say, that those who did better received more. While this system needs refinement, especially in the area of ensuring the integrity of the testing process, it provides the mechanism that introduces accountability in the current scheme of things. At the moment, it seems that no one is made to answer for the poor achievement levels of our school children. While at it, participation rates and completion rates should also form part of measuring the effectiveness of principals and teachers. The closest link to the pupils and the parents are the principals and the teachers. While these access indicators may seem to be mere statistics at the national level, at the school level, these are warm bodies whose future will be determined by the level of education they will receive. We often hear the “education for all” campaign in almost all administrations. But to emphasize, at the school level, the numbers are mere incidentals of what happened without the benefit of a deliberate and focus program to put children in school. For all the sloganeering of a free public school system, basic public education in most parts of the country is not really free. Any parent from schools of poor divisions will tell you so. Corollary to this accountability system, the superintendents should be made accountable for their principals, the regional director for their superintendents and so on and so forth, until the buck stops at the Department of Education Central Office — the Secretary. Clearly, by focusing on what our education officials should be made to answer for, we can compel them to be more responsive. Going back to where I started, while it is true that we need resources for the basic requisites to deliver free and quality public education to our school children, the mechanisms to measure their impact must be in place. Let us make our education officials accountable for the outcomes! This does not cost a lot of money, by the way. Before becoming an Interior Secretary, the late Jesse Robredo is a well-loved Mayor of Naga City and a Ramon Magsaysay awardee. "As mayor of Naga City from 1988 to 1998 he demonstrated that democratic government can also be good government," the awards committee said back in August 2000. The Ramon Magsaysay awards described Robredo's system of governance as "against patronage," and instead enforced a "merit-based system of hiring and promotion and reorganized city employees on the basis of aptitude and competence." Robredo's was on a twin-engine, four-seater Piper Seneca plane which took off in Cebu and was en route to Naga City. The aircraft crashed in Masbate and Robredo's body was found two days after. AnneLan, thanks for dropping by and making a comment. In 2007, there was an article that came out (http://www.citymayors.com/education/usa_schoolboards.html). In the US there is the question of whether mayors should have control or influence on schools. My take on this is that the system may be causing its own problems. There is no doubt in my mind that the education system must be decentralized. But for this to happen, teachers and principals need to be equipped. They need to be given both the responsibility and authority to guide their own schools. The problems are diverse and one size will not fit all. Of course, this requires local assessments (not necessarily exams, but one that does help inform the decision makers what is going on - good teachers would know how to get this information). This cannot happen with every detail of education being dictated from the top. This cannot happen without proper education and training of teachers in universities. 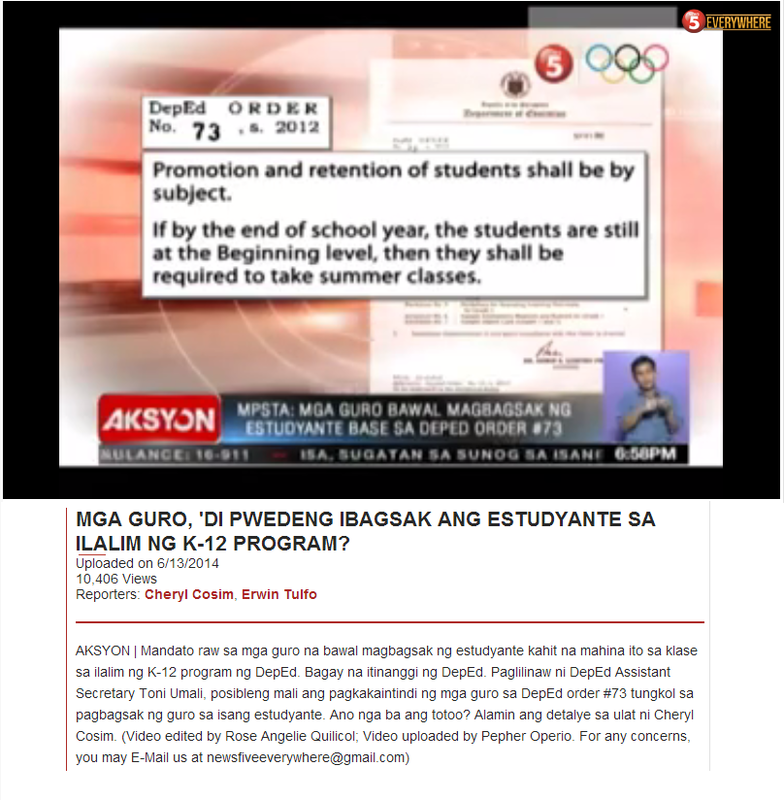 There is one article in this blog (DepEd K to 12: Role of Local Government, http://philbasiceducation.blogspot.com/2012/06/deped-k-to-12-role-of-local-government.html), that lays out the confusion, problems and challenges school-based management of education in the Philippines faces. And most of these arise because teachers lack the training and teachers are not given the responsibility. Teachers are unable to grow to become in charge of their classrooms.